When a rash of suicides tears through Cambridge University, DI Mark Joesbury recruits DC Lacey Flint to go undercover as a student to investigate. Although each student's death appears to be a suicide, the psychological histories, social networks, and online activities of the students involved share remarkable similarities, and the London police are not convinced that the victims acted alone. They believe that someone might be preying on lonely and insecure students and either encouraging them to take their own lives or actually luring them to their deaths. As long as Lacey can play the role of a vulnerable young woman, she may be able to stop these deaths, but is it just a role for her? With her fragile past, is she drawing out the killers, or is she herself being drawn into a deadly game where she's a perfect victim? Cambridge University psychiatrist Dr. Evi Oliver suspects that there is something sinister going on behind the spike in student suicides in the 5 last years. To be a bit more specific, she believes that vulnerable students are being identified and egged on into killing themselves. DI Mark Joesbury places DC Lacey Flint undercover into the investigation. Her job is to look pretty and vulnerable and see if she can uncover any online chat groups that appear to be pushing or encouraging students to take their own lives. She’s given clear instructions not to investigate but that is exactly what she finds herself doing. I haven’t read the first installment in this series so I have no idea what to expect from Lacey, but to me, it appears that she can’t help herself. If she’s going to do a job, she’s going to do it right. Looking pretty and vulnerable as Laura Farrow, wasn’t enough or working for her. At times she found herself in situations where she couldn’t keep Lacey Flint under wraps. In my first update on goodreads, I wrote that I didn’t get the feeling that I was missing much by not having read the first book. Well, I was young when I wrote that because the more I read about Mark and Lacey the more I wished I had the full story. It also might have explained why two people that care for each other can’t come out and say so. The way they acted in each other’s presence was somewhat juvenile. I half expected one of them to pass a note saying, “I like you. Do you like me? Check one: Yes__ No__ Maybe__” This didn’t take away from the story, I just wish I had a better understanding as to what was going on. The writing was really good. I’d finish a chapter and there, taunting me, was another short chapter begging to be read. Oh, one more isn’t going to hurt. Then another and another. All the while the tension was building and I’m thinking how did S.J. do that? I wonder what role, if any, the changing of the POV from first to third between chapters played in creating the tension. I didn’t have a problem with it until the first time it occurred in a chapter. That one caught me off guard. I wish I could sit here and tell you that I figured out what was going on, but I can’t. I’d be lying if I did. In fact, 85% in I still had no clue who I thought was responsible for the deaths. No one that I could definitively put my finger on. At this point I was just trying to get to the end and find out. Oh and that ending, nicely done. 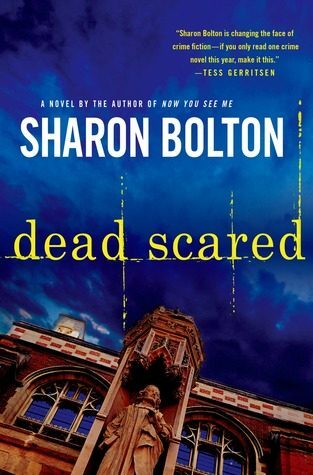 Not only will I read more stories in this series, I will also be checking out some of Sharon Bolton’s other works. This definitely sounds like a great read despite its minor flaws. Great review! Thank you, Yvo. Yes, definitely a great read. I love that it was not until further in that you realized you needed to read the first in the series. That is a sure sign of a book truly growing on you and wonderful character development that drives you to need more. The plot seems pretty original. I cannot recall anything like it in my reading history! Will you be reviewing the first for us? Definitely like to check this series out! Never read this author before!